Service outlets are government, government contract, or private facilities that provide aviation weather services. Several different government agencies, including the FAA, National Oceanic and Atmospheric Administration (NOAA), and the NWS work in conjunction with private aviation companies to provide different means of accessing weather information. The FSS is the primary source for preflight weather information. A preflight weather briefing from an FSS can be obtained 24 hours a day by calling 1-800-WX BRIEF from anywhere in the United States and Puerto Rico. Telephone numbers for FSS can be found in the Chart Supplement U.S. (formerly Airport/Facility Directory) or in the United States Government section of the telephone book. The FSS also provides inflight weather briefing services and weather advisories to flights within the FSS area of responsibility. The Telephone Information Briefing Service (TIBS), provided by FSS, is a system of automated telephone recordings of meteorological and aeronautical information. TIBS provides area and route briefings, airspace procedures, and special announcements. The recordings are automatically updated as changes occur. It is designed to be a preliminary briefing tool and is not intended to replace a standard briefing from a FSS specialist. The TIBS service can only be accessed by a touchtone phone. The phone numbers for the TIBS service are listed in the Chart Supplement U.S. (formerly Airport/Facility Directory). Figure 13-4. 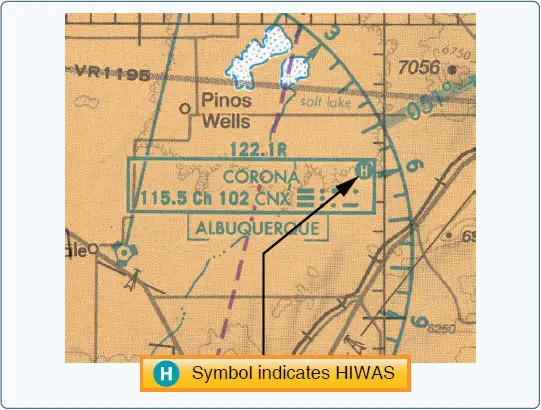 HIWAS availability is shown on sectional chart. A continuous automated broadcast of meteorological and aeronautical data over selected low or medium frequency (L/ MF) and very high frequency (VHF) omnidirectional range (VOR) NAVAID facilities. The broadcasts are automatically updated as changes occur. The broadcast contains adverse conditions, surface weather observations, PIREPS, and a density altitude statement (if applicable). Recordings may also include a synopsis, winds aloft forecast, en route and terminal forecast data, and radar reports. At selected locations, telephone access to the TWEB has been provided (TEL-TWEB). Telephone numbers for this service are found in the Alaska Chart Supplement U.S. (formerly Airport/Facility Directory). These broadcasts are made available primarily for preflight and inflight planning, and as such, should not be considered as a substitute for specialist-provided preflight briefings.